“Our overall goal is that, by around 2030, China will be among the major space powers of the world,” Wu Yanhua, the deputy chief of the National Space Administration, said recently.While the report doesn’t mention it, Chinese space officials have said they would put astronauts on the moon by the mid-2030s. China first sent an astronaut into space in 2003. Yang Liwei, a former fighter pilot, orbited the Earth for 21 hours inside a Shenzhou spacecraft, launched by one of the Long March rockets. The pace of exploration quickened from there. In 2007, a Long March rocket sent Chang’e-1, an uncrewed orbiter, for a 15-month rendezvous around the moon. In 2011, CNSA launched Tiangong-1, the first component for a prototype orbital laboratory like the International Space Station. A Shenzhou spacecraft carrying three astronauts, including China’s first female astronaut, Liu Yang, successfully docked with Tiangong-1 a year later. China returned to the moon in 2013, landing the country’s first lunar rover. CNSA lost control over its would-be space station in 2016, but a successor, Tiangong-2, launched not long after. In November, two astronauts spent 30 days aboard Tiangong-2, China’s longest crewed mission, to study how to live and work in microgravity. The Americans and the Russians have spent years learning about surviving in orbit on the ISS, but for the Chinese, this was pioneering work. China’s space activities represent “goals that any ambitious space country would want to pursue,” says John Logsdon, a professor emeritus at George Washington University who founded the Space Policy Institute there in 1987. And though China’s space capabilities are significantly behind those of the United States and Russia, particularly in deep-space exploration, experts say they’re about on par with Europe’s. (China and Russia have the technology to send people into space, while the U.S. doesn’t—at least until SpaceX and Boeing successfully test their NASA-sponsored Commercial Crew programs. )But there’s no space race, Logsdon says, despite some of the headlines that tend to emerge whenever China launches anything. Space exploration has always been as much a quest for geopolitical gain as it has for scientific discovery. The Americans and the Russians carried out launch after launch in the middle of the century not, first and foremost, for the sake of science, but in the name of national identity. China’s civilian and military space programs—and their motivations—are inextricably linked. Some analysts say it can be easy to overstate the influence of the Chinese People’s Liberation Army on space activities, and point out that the scientists and engineers on the civilian side are like scientists and engineers at NASA. But there is no solid delineation between the two. China’s ambitions in space are as strategic as the Vostok and Apollo programs of the 1960s. “When you are the first country to land a probe on the far side of the moon, that says something about your science and technology, that says something about your industry,” says Dean Cheng, a senior research fellow at the Heritage Foundation, a conservative think tank in Washington, D.C., and one of the few Chinese-speaking analysts in the U.S. that focus on China’s space program. “It says something about what you can achieve that in turn is going to affect how countries view China when it comes to terrestrial issues, whether it’s border disputes, whether it’s building islands in the South China Sea, whether it’s Taiwan’s future.”The Chinese government is notoriously secretive about both its civil and military space activities, but it has at times provided small glimpses of its work in the last decade. 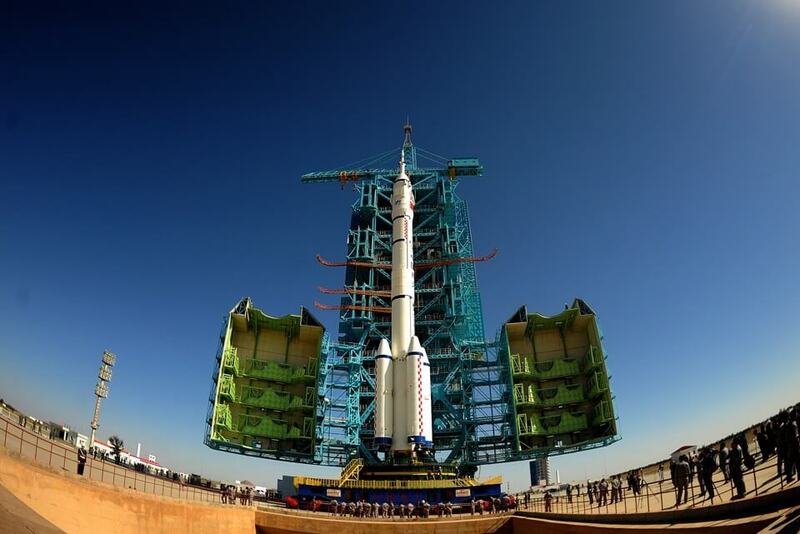 The Shenzhou 6 launch at the Jiuquan launch facility in 2005 was broadcast live. Foreign reporters were banned from attending the launch, and such access remains restricted. The same goes for private citizens, who are not likely to reach Jiuquan and other launch sites, which are located in remote areas. For outsiders, understanding the country’s pursuits requires reading between the lines. Take CNSA’s recent mention of China’s efforts to improve its satellite remote-sensing system, for example. “That’s also called a spy satellite,” Cheng points out. Such is the two-side nature of space exploration: A rocket can launch a capsule to the moon—or a bomb toward an enemy. China’s cislunar activities, particularly its crewed missions, are aimed at cementing its place as a major player in space. “Human space flight is generally recognized by scientists the world over to be the most expensive but least scientifically beneficial use of the human and fiscal resources national governments devote to space-related activity,” Gregory Kulacki, a senior analyst and China project manager at the Union of Concerned Scientists, an American nonprofit group, explains in an email. “The scientific benefits of crewed missions are small. But the geopolitical benefits are huge.”For the same reason, American lawmakers in Congress have spent years telling NASA to get humans into space on its own—not for a desire for more scientific research, but because they don’t want to depend on Russia for the technology. Kulacki says Chinese scientists have told the government that robotic missions into deep space provide more scientific opportunities and cost less—but they’re not as flashy as a smiling spacewalker on the moon. Not all of China’s cislunar activities have been as civil as launching a rover. In 2007, the country deliberately launched a projectile at one of its defunct weather satellites and blew it up, sending thousands of pieces of debris soaring through Earth’s orbit. The anti-satellite test was the first of its kind since 1985, when the U.S. launched a rocket at one of its satellites. China did not confirm the test had occurred until after Western news reports emerged. The government received a public dressing-down from the international community, but maintained it wasn’t seeking to weaponize space. In late 2014, China asked the U.S. to share information about possible satellite collisions, an unprecedented move that was welcomed by the American security community. According to U.S. defense officials, China has continued to conduct anti-satellite tests. None have scattered significant debris, but security officials and analysts remain wary. Inside China, space activities, civil and military, are used to stoke nationalist sentiment. Public opinion data is nearly impossible to obtain, and if pollsters wereasking the Chinese population about their priorities, they wouldn’t start with questions about the moon, Cheng says. Manufacturers mention the space program in their ads in an attempt to assure consumers of their product’s quality, a particularly sneaky tactic in a nation with significant lapses in quality control. Cheng said he once drank bottled water with a label bearing a tiny image of a Chinese astronaut and the message “water used on the Shenzhou.” (U.S. manufacturers did the same in the 1960s; sales for the powdered fruit drink Tang rose after commercials started mentioning that the Gemini astronauts drank it in space. )“The Chinese government has certainly tried to use space as part of its arguments for de facto legitimacy,” Cheng says. “It is no accident that senior science leaders are consistently photographed at the launch of major missions.”If there is a space race anywhere, experts say, it’s inside Asia—and it’s more of marathon than a sprint. India put a spacecraft into the orbit of Mars in 2014. South Korea is preparing for rocket launch tests in 2019. And Japan is aiming to send its first lander to the moon in 2019.Perhaps the feeling of a race has always been felt most acutely inside nations, between scientists and political leaders. When the Russians sent Sputnik up in 1957, Mao Zedong decided the Chinese would launch their own satellite to space in 1959, the 10th anniversary of the People’s Republic of China and a favored target for the completion of many projects of the Great Leap Forward, the leader’s ultimately disastrous attempt to rapidly industrialize the country. Scientists knew this would be impossible with the technology they had, and the deadline came and went. China would not launch a satellite until 1970, and political pressures would take precedence over preparedness once more. The first satellite was planned to feature sophisticated, data-collecting instruments. But the directive from the top to scientists was to “get it up, follow it around, make it seen, make it heard,” according to a history on China’s space activities Kulacki wrote in 2009. In the end, the satellite could only play the first few bars of “East Is Red,” an instrumental song glorifying Mao and his Cultural Revolution, as it whirled around the Earth.